With the U.S. divorce rate hovering just over 50 percent and higher in other parts of the world, most of us know someone who has been divorced or is in the process of a divorce. Divorce strikes close to home and impacts us personally in one way or another. It is difficult to know what to say to someone in this most challenging situation. Do we rush in to offer advice, stand back, or ask the individual involved how we can best befriend them? I would like to know what to say to a friend whose husband is divorcing her. She is depressed. She said she can’t take it anymore. What should I say to her and then how should I pray for her? Jean’s friend is obviously struggling. She seems to be struggling not only with the divorce but with events leading up to the divorce as well as the impact this is having on her. Let’s consider what her friend might be feeling? How can she best help her friend and what does she need to do to deal most effectively with this situation? First, recognize the severity of the situation. Not only is her friend divorcing, which of itself can be traumatic, but is depressed as well. It is likely that her friend has struggled with her troubled marriage and events leading to the divorce. It is always best to approach someone who is depressed and invite conversation. Don’t be afraid to ask tough questions about how they feel, their thoughts and whether they are taking good care of themselves emotionally. Listen keenly for any thoughts regarding self-harm and, if in doubt, don’t be afraid to ask about this directly, taking appropriate steps of action. Second, offer emotional support. Most going through a divorce feel profoundly alone. Again, it is likely she has felt alone for some time leading up to this divorce. The world appears “coupled up” to them. Invite your friend to talk about their experience and maintain an active friendship with them. Encourage them to remain active, even though they may be tempted to withdraw. Activity is a powerful antidote to depression. Third, be careful not to take sides. While you certainly need to offer friendship and support, you don’t need to take sides if you are friends with both husband and wife. You can offer deep friendship, support and compassion without engaging in taking sides. Fourth, encourage grieving. Divorce is, in many ways, a death. It is the loss of a dream and a hope of where one expected to be. It can feel devastating and unfair. 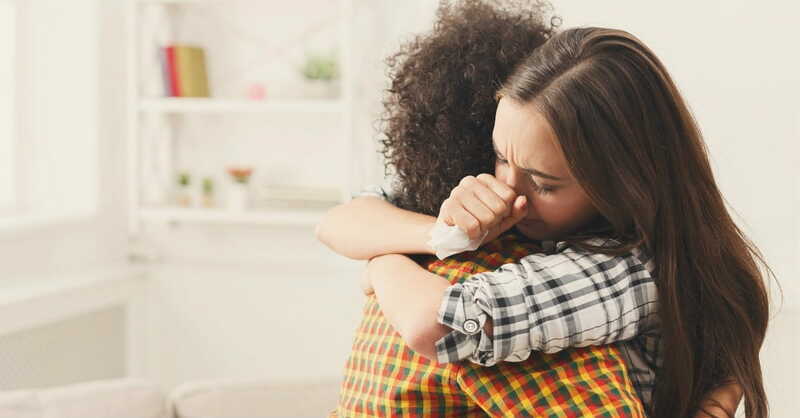 Encourage your friend to move through all stages of grieving. Pray for them to “grieve well”—feeling all the feelings anyone might feel in a divorce and the loss of their marriage. Encourage professional counsel if it is needed to facilitate the grief process, as appears to be the case here. Finally, help envision a path of healing and recovery. Most importantly, offer hope. Healing and recovery are possible from divorce. Encourage your friend to get support from groups such as DivorceCare and to begin cultivating a new path of living and recovery. While divorce is certainly a death, there is new life around the corner if she looks for it. Help her see the possibilities she can find if she looks for them. Do you know someone going through a divorce? We at The Marriage Recovery Center are prepared to walk with you through this challenging season. Please feel free to contact me at MarriageRecoveryCenter.com or email us at frontdesk@marriagerecoverycenter.com.